For over 30 years, Nutrafin has been dedicated to improving the quality and effectiveness of fish nutrition and water treatments. Nutrafin’s long-standing commitment to scientific research and development in fish nutrition and water chemistry management is reflected in its wide range of trusted fish food and water treatments. 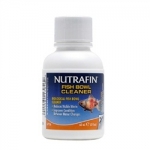 Nutrafin Max is a leader in quality nutrition for many fish species. Nutrafin water treatments – Aqua Plus, Cycle and Waste Control – create optimum conditions for the health and well-being of fish. We here at Aquarium Spare Parts endeavour to keep all genuine Nutrafin lines in stock. However if there is a product you are looking for but have not seen on our website please contact us at findmypart@aquariumspareparts.com.au and we will do our best to source the part for you.